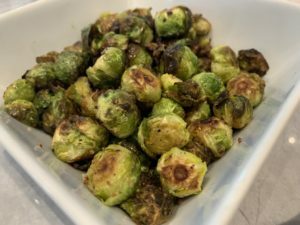 Oven roasted Brussel sprouts are so easy to prepare. 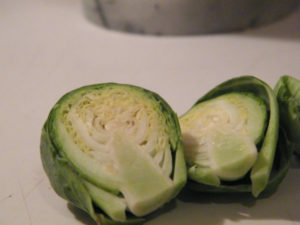 They make a terrific side dish and work perfectly for a vegetarian appetizer before a dinner party. The more crispy and charred the better they taste. They’re easy to find in most grocery stores and are available already washed and trimmed. If your grocery store doesn’t carry them prepared, don’t worry as the preparation is easy. I keep the seasoning simple as well with just some salt, pepper, olive oil, and a few fresh garlic cloves that I gently smashed by using the back of a knife. Preheat the oven to 400°. 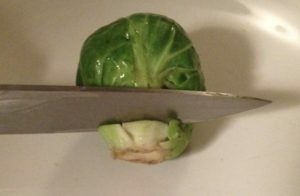 Start by rinsing the sprouts under cold running water. Using a sharp knife cut the bottom tip off and slice in half the long way. 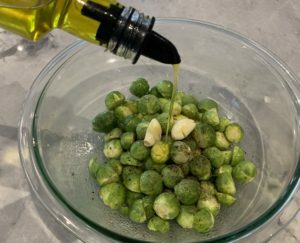 Place the prepared Brussel sprouts and garlic cloves in a large bowl and drizzle with olive oil. Sprinkle with salt and pepper, then gently toss until evenly coated. Spread them in a single layer on the baking sheet and bake for 20 minutes, or until crisp and charred on the outside. Remove the baking sheet from the oven and let sit for a minute. Serve immediately or continue with the optional glaze mixture below. In a small mixing bowl, whisk together the balsamic vinegar and honey. 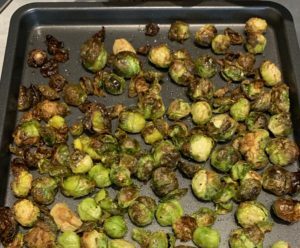 Drizzle the sprouts with the balsamic/honey mixture and gently toss to combine.